As with any new and rising toy trend, a whole host of companies have been creating their own brand of balance bike, and Little Nation bikes have found competition in a somewhat unexpected form: wooden balance bikes. Because of the recent resurgence of nostalgic wooden toys, a market has been created for these wooden bikes from such recognizable names as Red Ryder. But how do these wooden bikes compare to the steel-framed bikes produced by Little Nation and other manufacturers? The short answer is that they don’t. Wooden bikes, while sharing the same functionality traits as metal balance bikes fall short in other areas that really matter. For instance, wooden bike frames are significantly less adjustable than steel or aluminum frames due to the inherent rigidity of their design. This makes them less than ideal for children in the earliest or latest ages in the market for balance bikes. This extra rigidity doesn’t lend increased durability, either. Wooden frames are more easily damaged, warping in the sun or with exposure to water. 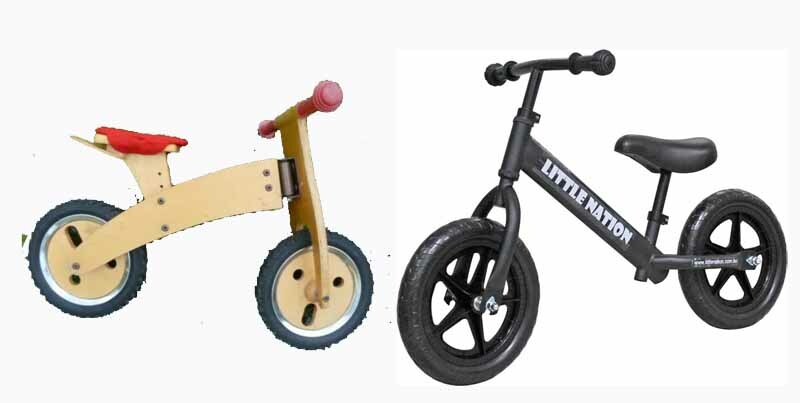 Despite the low ticket prices of many of these wooden models, the price differences between metal and wooden balance bikes is negligible. Many high quality, durable metal bikes, including those from Little Nation, are available at competitive prices. In short, wooden bikes are great talking pieces and good for a bit of nostalgia for a simpler time, but they just aren’t the quality of toy we want for our kids.